Pruning young trees requires an understanding of how trees grow. Sounds obvious, but in truth many people lack even a basic understanding of this. There are three key points one needs to know about how trees grow in order to get them off to a healthy start. Without this knowledge you can make mistakes that could persist for the life of the tree, reducing its aesthetic value, and even possibly leading to catastrophic limb failure years later. While tree pruning is probably the most commonly performed tree care service, if done incorrectly it can have severe negative long term impact on tree health and safety. For a detailed explanation of what correct pruning is and isn’t, see my “Pruning Tips” page. 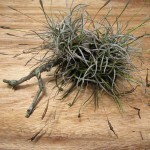 Ball moss and mistletoe are two common tree pests in Central Texas that are frequently removed during tree pruning. Here is some info on what these plants are, how they are harmful and how they can be treated. 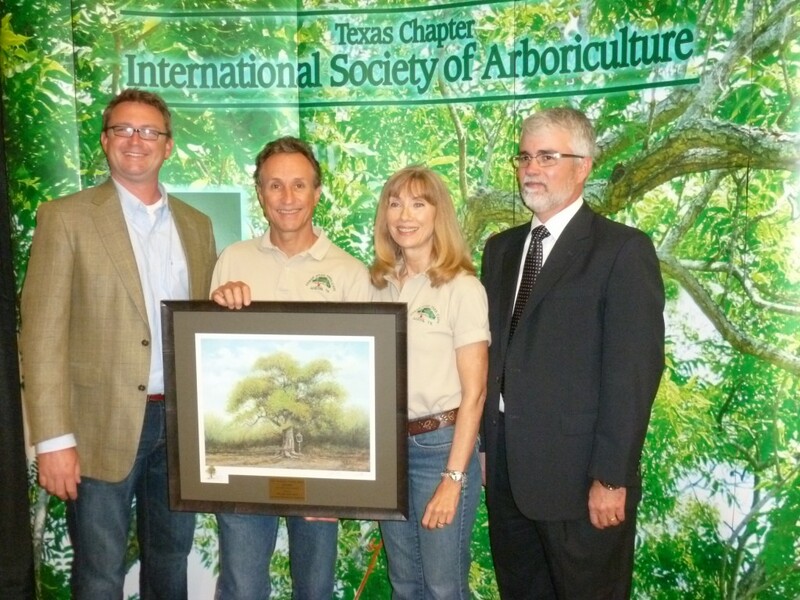 Guy LeBlanc is honored to have been named the 2012 Texas Arborist of the Year by the International Society of Arboriculture Texas chapter and the Texas A&M Forest Service. It is awarded in part for his 35 years in the tree care business, and his volunteer efforts to increase the public’s awareness of proper tree care. Guy LeBlanc (2nd from left) receives the 2012 Texas Arborist of the Year award. 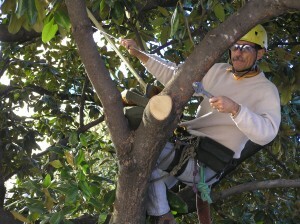 Unless you were specifically looking for me, you probably came across this site while searching for tree trimming, pruning, arborist, or some other tag words, and along the way have seen or may see sites for dozens of so-called arborists. My oh my, how ever does one choose? There are lots of variables that can help you find a competent person to provide tree care for you, but I’ll start with the word “arborist”. It may surprise you to know that unlike “doctor” or “lawyer”, there isn’t any sanctified definition of this title, or the use of it- anyone with a chainsaw and a ladder can call his or herself one. So that can be a clue right there- anyone stating or implying that they are “licensed” by the state (of Texas) to perform tree care is, as politicians love to say, being disingenuous. Yet there is such a thing as a Certified Arborist. The certifying organization is the International Society of Arboriculture. They have had a national certification program in place since around 1991. In Texas, the first I.S.A. Certified Arborist exam was given in 1992. I was among the small number who took and passed that test, and I have maintained my certification ever since. Renewal requires acquiring only 30 CEU’s over a three year period; I have totalled over 700. In fact, I am hired by ISA and the Texas Forest Service and other agencies to teach many of these CEU classes. It is important to remember that passing the Certified Arborist exam does not make one the be-all-end-all of tree knowledge. It is a test of the most basic knowledge one needs for tree care, and the prerequisites for being able to take the exam could include having planted flowers for a living (not that anything is wrong with that). So there are some very smart people with pretty much no tree care experience who have passed the exam, and a lot of not-so-smart ones with lots of experience doing tree care really poorly. So don’t let this be your only qualifier. 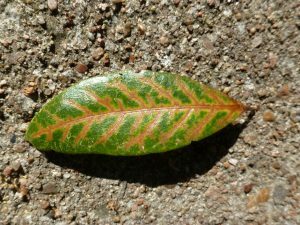 It is also important to know that most tree services in Austin do not have Certified Arborists actually performing the work they sell. Often a company has a Certified Arborist as its owner, salesperson or foreman, and the people actually doing the work were digging ditches the month before (not that anything is wrong with that). You’re better off hiring a company in which Certified Arborists actually do the work, like mine. And don’t be confused by the Certified Tree Worker designation (which I also have). This certification focuses more on basic climbing skills, not arboricultural knowledge. While it is admirable for a company to certify its employees, it is by no means an assurance that the consumer will receive quality work. It’s important to make sure that persons working on your property have an adequate amount of quality experience to back up their certification. I recommend a minimum of 20 years for the owner or manager of your account and 7 years for those actually doing the work. Yes, there are many with less experience that are quite competent, but the chances of getting an incompetent one (or worse) are higher with less experience. However, there are also unfortunately many with more experience who are incompetent or even outright dishonest. Insurance is another factor to consider. 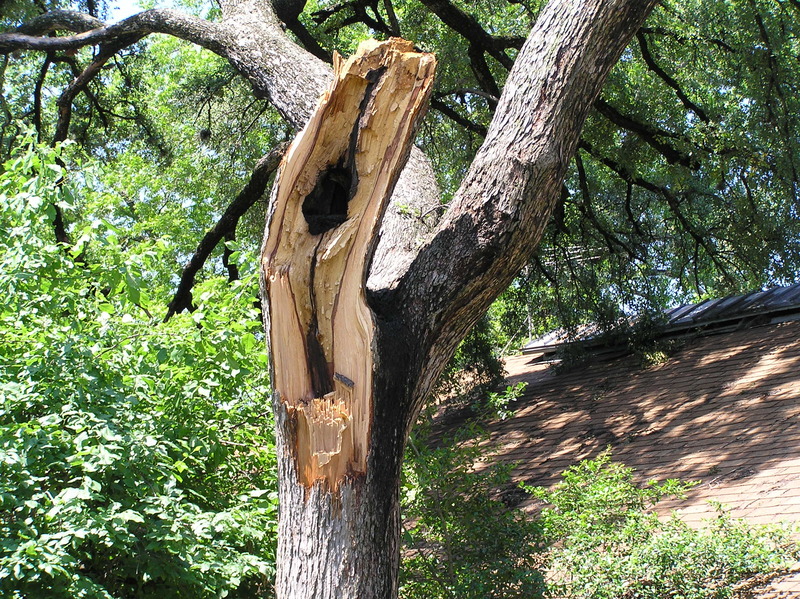 All competent tree services in Austin carry appropriate insurance. This means general liability insurance, personal injury insurance for owners and workers compensation for employees. It may surprise you to know that none of these are required by law in the state of Texas. Just to be clear, remember that having these insurances is not a guarantee of quality work. Be especially wary of memberships. My personal experience is that the more prominently a company advertises memberships, in the Better Business Bureau for example, the less likely they are to be a quality operation. The BBB has absolutely no enforcement power, and has little incentive to punish businesses who pay a fee to be members. Likewise, memberships in tree associations like I.S.A. or T.C.I.A., without accompanying certifications or accreditation, mean nothing more than that someone paid an annual fee to use the group’s logo. I have seen several tree companies in Austin over the years advertise membership in organizations that don’t even exist! Finally, check the arborist’s work. 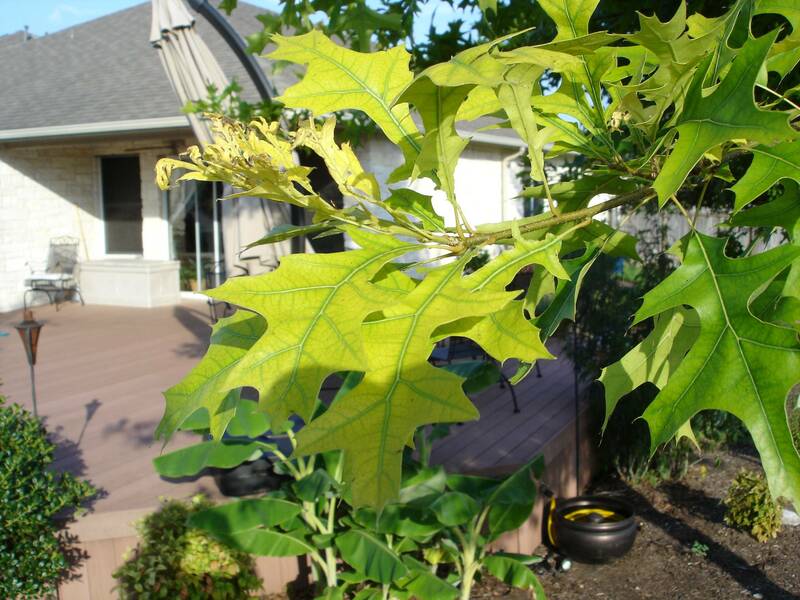 You can become familiar with what proper tree care is by reading about pruning on my website, and ask for and verify references. Obviously, a company isn’t going to tell you about people who have been dissatisfied with their work, and internet referral sites are laden with misinformation (both pro and con), but if you take the time to become familiar with what a properly pruned tree should look like (it’s not rocket science), you can look at a few dozen trees and tell whether they have been pruned well or not. Or just make it easy on yourself. Hire Guy LeBlanc!